Do you have a busy, packed schedule and not much time to cook? 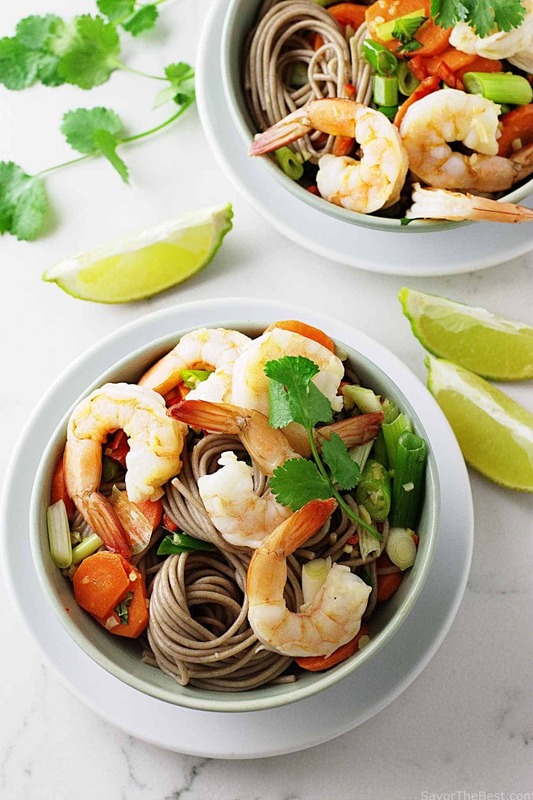 Our recipe for Soba Noodles with Shrimp and Spicy Peanut Sauce is just what you need for a fast and easy lunch or dinner and it can be served hot, cold or at room temperature. You can have this on the table in 30 minutes or less, to me that is fast! Soba noodles are fast and easy to make. When you combine them with a little protein and a variety of fresh sautéed vegetables you can have a nutritious, healthy meal in a jiffy. We selected shrimp, carrots, scallions, garlic, ginger, red pepper, Thai basil and cilantro. The Thai spicy peanut sauce and crunchy salted peanuts compliment and flavor this dish beautifully. A commercial peanut sauce may be used or you could use our recipe listed in our Lemongrass Chicken Satay recipe. After cooking the noodles rinse them in cold water then drain them and toss with a little toasted sesame oil. The sesame oil not only keeps the noodles from sticking together but adds an amazing flavor to the noodles. You can use sesame oil to cook with, but if you use sesame oil as a finishing oil, it has a more pronounced flavor. Soba is the Japanese name for these noodles which are made from buckwheat flour. Actually, buckwheat really isn’t a wheat at all but it is a seed that is a relative of the rhubarb plant. Weird, huh? Buckwheat is one of those ancient grains that is centuries old. We thank the Japanese for creating the soba noodle for us. Buckwheat is gluten-free and considered safe for people with celiac disease and gluten-intolerant diets. However, (now didn’t you just know there was a catch in there?……not all soba/buckwheat noodles are created equal as some manufacturer’s combine common wheat flour with the buckwheat flour and this can be disastrous for someone with celiac disease. If this distinction is important to you, then make sure you check the label when buying buckwheat noodles. Just make sure they have 100% buckwheat flour, as many manufacturers mix buckwheat and wheat flour to make a more sturdy noodle. Soba noodles are readily available in the International section of most grocery stores but you may have to search out 100% soba/buckwheat noodles at the Asian markets or online. We served this dish of soba noodles with lots of lime wedges and a cold-frosty beer to cool off the spicy heat. 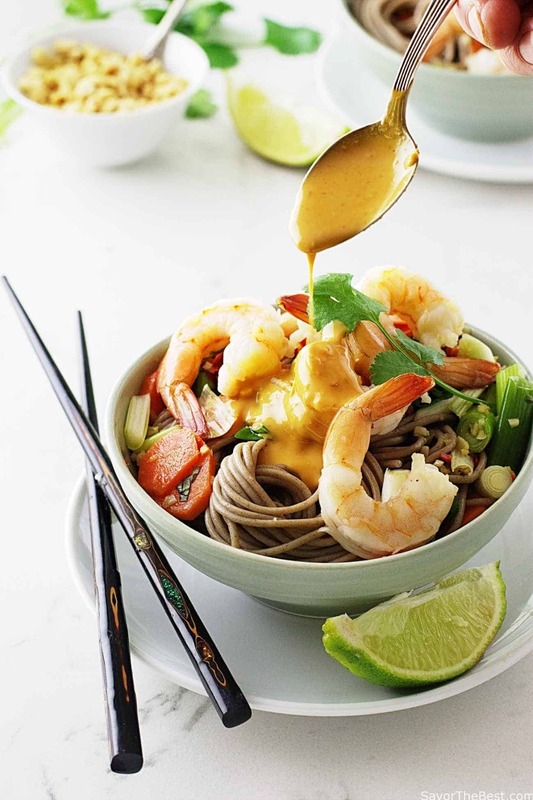 Soba Noodles, Shrimp and Spicy Peanut Sauce is a quick, healthy one-dish meal. Tons of flavor from toasted sesame oil, ginger, garlic and spicy peanut sauce. 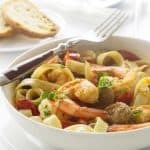 In a large skillet set over medium heat, add the olive oil and when it has heated but not smoking hot add the shrimp and cook, stirring until they have turned pink and curled into a ‘C’ shape. 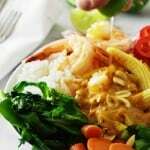 Transfer the shrimp to a paper-towel lined plate and reserve. Some of the shrimp will cook faster than others so remove them as they cook. Add the carrots and scallions and cook while stirring for 30 to 45 seconds. Add the ginger, garlic and the minced red chile. Cook and stir just until the garlic becomes soft and fragrant. Remove the skillet from the heat and stir in the soy sauce, Thai basil and cilantro leaves. 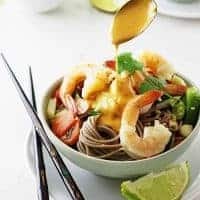 Divide the vegetables equally to the top of each bowl of noodles and add the shrimp. Spoon a tablespoon of peanut sauce on each serving and garnish with peanuts and fresh cilantro sprigs. 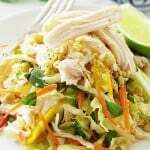 Serve with fresh lime wedges. Not all soba noodles are gluten free. If you need to be on a gluten free diet, make sure your soba noodles are not made with added wheat. 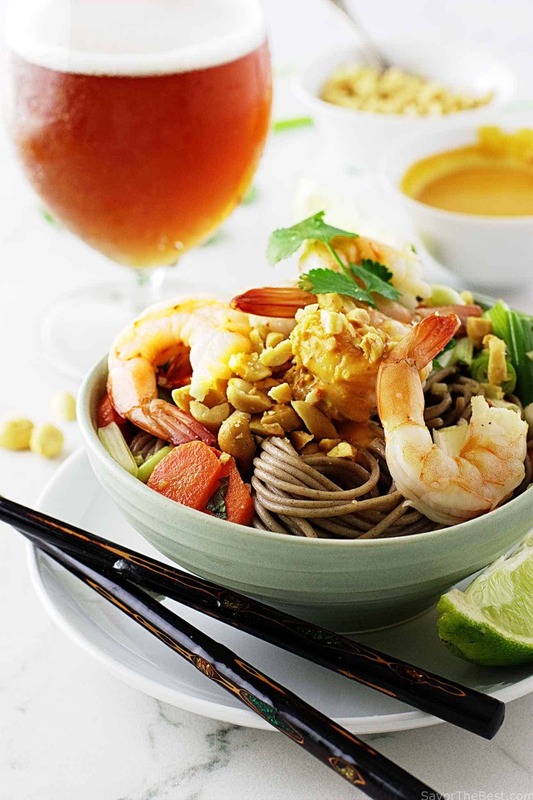 Have you made these soba noodles with shrimp and spicy peanut sauce? We would love to hear from you. Drop us a comment below.